February 21, 2011 - EasyJet, the UK's largest airline, announced that it is the first commercial airline to trial a revolutionary nano-technology coating on its aircraft aimed at reducing drag and increasing fuel efficiency. The ultra thin coating, already used on US military aircraft, is a polymer that cross links and bonds to the paint surface and only adds an estimated 4oz to the weight of the aircraft. The coating reduces the build up of debris on the aircraft's structure, leading edge and other surfaces; thus reducing drag on the surface of the aircraft. The manufacturers of the coating estimate that it could reduce easyJet's fuel consumption by 1-2%. The airline has coated eight aircraft and will compare their fuel consumption with the rest of the fleet during a 12 month trial period. An easyJet passenger is responsible for 22% fewer emissions than a passenger on a traditional airline, when they fly the same route and use the same type of plane. 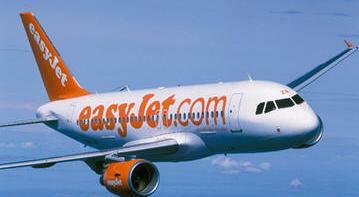 Since its launch in 1995, easyJet has always strived to improve its efficiency to keep its costs down. Passengers benefit through low fares and a reduced carbon footprint. This is achieved through a range of investments and innovations. easyJet's fleet of 194 aircraft, many with Tech Insertion engines, is one of the youngest in Europe averaging less than four years old. It fills more of its seats than more than any scheduled European airline with a load factor of over 87%. easyJet planes taxi using one engine, use less ground equipment than legacy carriers and fly passengers to airports close to city centers, often with good public transport links. Weight onboard is reduced with light-weight carpets and the airline is currently looking at lighter seats in the cabin. "easyJet is really pleased about the trial with the special coating on our aircraft. Efficiency is in easyJet's DNA. If we can find new ways of reducing the amount of fuel used by our aircraft we can pass the benefits onto our passengers by offering them low fares and a lower carbon footprint. All airlines should be incentivized to reduce the environmental impact of their operations which is why we welcome the government's commitment to move from APD to a fairer, greener per plane tax. We look forward to seeing the details of their proposal,? said Carolyn McCall easyJet's CEO. The nano coating, 'nano-technology' is a polymer that enables this high performance solution to cross link and bond with the surface materials to which it is being applied. It contains hard, durable acrylic elements and creates a perfectly smooth finish, filling the 'pores' of a surface with a unique resin. This forms a barrier to prevent penetration by contaminants of the 'hills and valleys' of a surface our eyes cannot see. Applying the coating, in the preparation solution a dicarboxylic acid a "cationic" (positive) polarizing wash is used to purge the pores of the surfaces to be treated and electrically charge the surface with a positive polarity. The pores are cleansed and charged and are ready to receive the unique "anionic" or negatively charged molecules of the emulsion. These molecules are pulled into the pores magnetically and held there, while all of the protective chemicals have cross-linked, bonded and cured, locking the coating into the paint and preventing drifting, fading or degradation of the paint until renewal. The coating is less than a micron thick when applied. A micron, short for micrometer, is a unit of measurement equal to one millionth of a meter. The special coating is applied and distributed in the UK by an organization called TripleO.